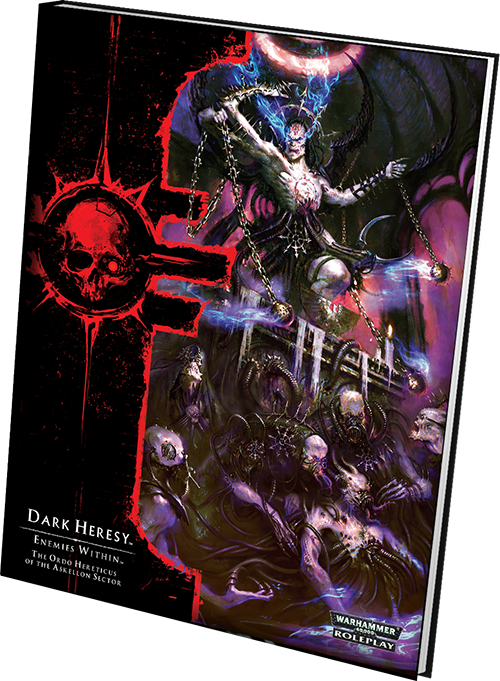 11 March 2015 | Dark Heresy 2nd Ed. The Askellon sector is plagued by heresy. It seeps in from the Warp. It attacks from the borders of Imperium space. But most insidiously of all, it worms its way out from within. Like a living body with a gangrenous limb, the only cure is to purge the dead flesh with scalpel and fire. This duty falls to the men and women of the Inquisition and the Ordo Hereticus, who pursue it with the single-minded zeal befitting a servant of the Emperor. These fearless Acolytes can come from any world and any background. Now, with the upcoming release of Enemies Within, you’ll find new home worlds, new backgrounds, and new roles to bring new life to your Acolytes in Dark Heresy Second Edition. For more information on the new player options in Enemies Within, we turn to producer Tim Huckelbery! Enemies Within is the first Dark Heresy Second Edition supplement to cover the Ordo Hereticus and the threats to Mankind that emerge from within humanity itself. In addition to breaking new ground with its theme, it includes a great deal of new content for players. Some of the most exciting new additions are the new options available for character creation. 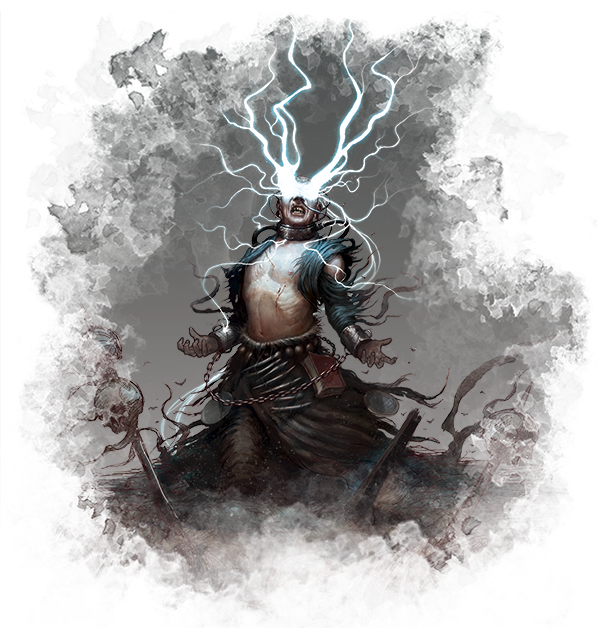 Creating Acolytes in Dark Heresy Second Edition is a three-step process, whereby a player selects his character’s home world, the background his character had before entering service to an Inquisitor, and finally, his character’s role – the abstract description that captures the Acolyte’s essence. Even without the new options introduced by Enemies Within, the Core Rulebook includes a solid selection for each stage: six home worlds, seven backgrounds, and eight roles, resulting in several hundred possible combinations in creating a new Acolyte! Because of the massive diversity within the Warhammer 40,000 universe, each of these possible combinations can act as the basis for a memorable character, with the wilder and seemingly more unlikely combinations only birthing more unique Acolytes. The character creation process also allows a group to all hail from the same background (such as the Adeptus Arbites), but play very different types of character (their Arbitrators could range in style from clue-seeking detectives to urban warriors). By using the new home worlds in Enemies Within, countless new combinations open to Dark Heresy players. An Acolyte could have been born on a bountiful agri-world, a technologically-frozen feudal world, or a harsh frontier world. Each of these types of home worlds, like the ones in the Core Rulebook, includes a unique home world bonus drawing on the flavour of that location. This book also covers several specific worlds within the Askellon Sector, and as in the adventure Forgotten Gods, each of these worlds also gains a unique home world bonus which replaces the standard bonus for that home world. Thus, an Acolyte from an agri-world can be created using the standard agri-world rules, drawing strength from the land. Alternatively, you could create an Acolyte hailing from the agri-world of Kalto and harness that planet’s bonus to deny your body’s demands in the face of fatigue or starvation. In total, Enemies Within explores eight new Askellian locations, including Port Aquila’s lawless asteroids, the harsh frontiers of Temperance, and the fanatical forge world of Selvanus Binary. Keeping with the central theme of this book, each of these new worlds is rife with heretical cults, insane psykers, and misshapen mutants, and each includes a special investigation template for Game Masters to use when launching new adventures. Players also gain access to two new backgrounds to use for their characters. Your Acolyte may have come from the Adepta Sororitas, serving the Imperium in a variety of functions. Or your character may have been scorned as a lowly mutant who now fights his own kind to prove his loyalty to the Emperor. While those from the Adepta Sororitas never suffer Corruption (instead gaining Insanity), Mutant Acolytes begin the game with Corruption and a starting mutation. Joining these backgrounds are two new roles: Fanatic and Penitent, each representing an extreme mental outlook that could arise as you fight Mankind’s enemies with fiery dedication. 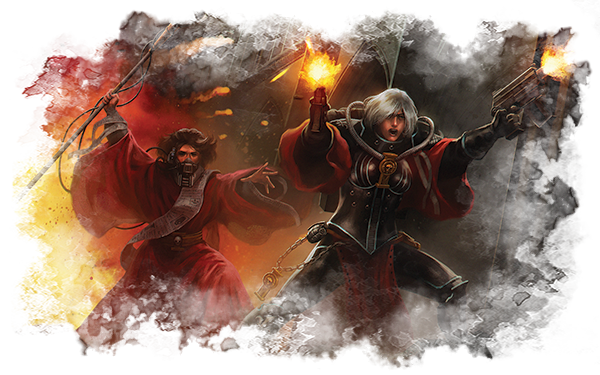 In addition, for those wishing to enhance their Adepta Sororitas characters further, the new Sister of Battle elite advance introduces special new talents, power armour, and Godwyn-Diaz bolt pistols! We really enjoyed creating these new options to help players build new and compelling Acolytes. Each of these options helps your characters to better serve (or act as) an Inquisitor of the Ordo Hereticus and battle your targeted threats: heretics, mutants, and witches. 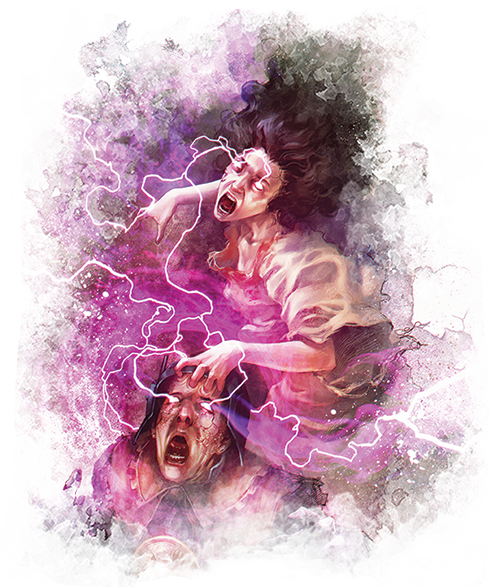 From fanatical feudal worlders burning witches in fiery braziers, to sharpshooting frontier worlders eradicating mutant enclaves, to penitent Adeptas Sororitas eager to atone for their sins, there is a huge range of new possibilities to be found. One of the best aspects of this struggle is that these threats can be found wherever there are humans. Acolytes find their enemies everywhere they look – even in the mirror. So long as there are humans in the Imperium, there will be enemies within! There is necrotic flesh within the Imperium, corrupting it from within. Heretics, witches, and mutants are everywhere and it falls to you to destroy them with cleansing flame. Bank the coals and stoke the fires: the safety of the Imperium depends on you! Pre-order Enemies Within at your local retailer today.